A surprising piece of news was buried in an article this week. Friday, The Mercury News reported the three top executives at Google, Larry Page, Sergey Brin and Eric Schmidt, are offering to pay $33 million to finish the restoration of the historic airship hangar at Moffett Field. The giant structure, built in the 1930s and called Hangar One, sits a few miles from the Googleplex and it’s well known the Google executives have special permission from NASA to park their jets at Moffett. The jets are not owned or operated by Google. Instead, the 3 Google leaders operate the fleet through an LLC called H211. Google has no official relation with H211. Ken Ambrose, the Director of Operations for H211, announced the funding offer at a public meeting this week. He also complained that NASA, which owns Hangar One, has taken too long to respond to the offer. On first glance, it sounds like a purely noble gesture by the Google trio. The building is in the middle of a project to strip toxic materials in its siding. Lack of taxpayer funding to complete the project has raised fears that could lead to the demolition of one of the world’s largest freestanding structures. But, as the Mercury News reported, “There’s a catch: They want to use up to two-thirds of the floor space of the hangar to house their fleet of eight private jets.” Most of the members on the Hangar One committee, along with the local congresswoman, support the idea, although there is some concern about the public-private partnership. But whoa. Wait a minute. The Google execs own eight jets? 2.6 jets per person, for the 2 co-founders and the executive chairman? In 2007, TechCrunch reported on the Google execs first jet, a modified Boeing 767 and the controversy it created. (See Search Engine Land’s Guide To The Google Jet for more info.) In addition to the Boeing 767-200, they own two Gulfstream Vs.
Later, in 2007, the team picked up another Boeing, a 757 this time. A NASA lease document with tenant H211 lists those four planes. (PDF: see Exhibit C) Images of the Google jets can be seen here. Despite some fake images appearing around the web, there’s no Google logo on the planes. In 2008, the New York Times reported they appear to have added a Dornier Alpha fighter jet to their fleet. But, counting the fighter jet, that’s only 5 jets. What about the other 3? Perhaps, the Merc got the number wrong? Thanks to a “Google Search,” two more articles came up confirming Ken Ambrose said “8” planes at the meeting. One in the Mountain View Voice, and another with detailed notes of the Moffett Field Restoration Advisory Board subcommittee meeting on a Moffett Users website. At the meeting, a member of “Save Hangar One” said they don’t want to see “Google” in 200-foot letters on the hangar as part of the deal. Ambrose said the Google team didn’t want that either. TechCrunch is trying to contact Mr. Ambrose for more information about the additional three jets. The Google leaders and their friends are not the only ones using the jets. NASA conducts flights on the planes with its own researchers and equipment to gain scientific data. That deal was part of the unusual agreement with NASA allowing the Google team the use of Moffett Field, an airport closed to private aircraft. When that deal was announced, it raised concerns from the local community leaders opposed to expansion at Moffett. Other Silicon Valley private jet owners and users, who are not allowed to use the airport, couldn’t have been pleased either. The Google jet fleet has been a source of fighting and controversy over the years. The Wall Street Journal reported on the lawsuits with its contractors and the famous dispute, settled by Schmidt, over what size beds the co-founders would have on the plane. Of course, lots of CEOs and executives own or lease private jets. On one hand, the Google leaders can spend their money any way they please. Their time is valuable, and using the jets makes them more efficient. On the other hand, using private jets is not very environmentally friendly for leaders of a company that prides itself on being green. See Google Green. 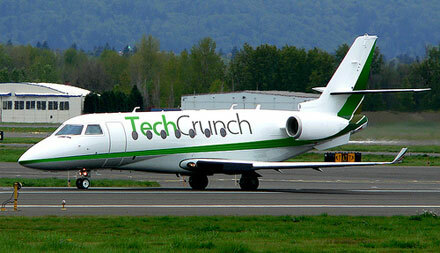 Speaking of private jets, Michael Arrington posted this photo of the TechCrunch jet on his posterous page in 2010. It hasn’t been seen since our AOL buyout.